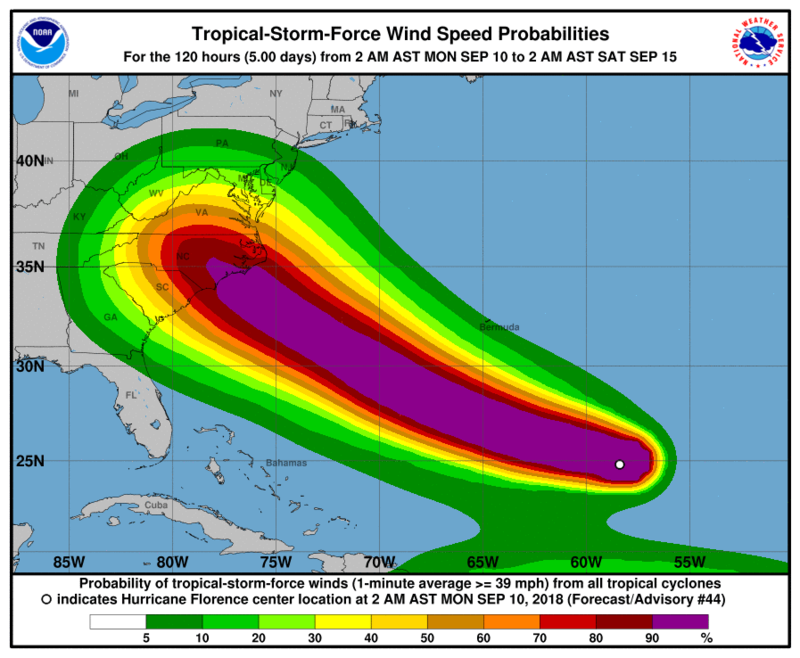 The current projected path of winds from Hurricane Florence as it is expected to make landfall Thursday. The latest computer models suggest a turn to the north that could impact the Chester County area. While there are a large number of variables, local residents should at minimum stay alert as to the path and progress of Hurricane Florence, which looks to make landfall Thursday somewhere along the Carolina or Virginia coast and could cause heavy rain, flooding and winds in the Chester County area, Friday. The storm, currently southeast of Bermuda, has strengthened to a Category 3 and is expected to stay at least Category 3 before hitting the east coast, with a strong chance of it becoming a Category 4, thanks to warm water in the south Atlantic Ocean. South Carolina, North Carolina and Virginia have all issued State of Emergencies for this coming weekend, as the likely first location for Florence to reach landfall. So what does this mean for area residents? Under the best case scenario, we’ll see some scattered rain, some minor flooding and winds up to 20 MPH throughout the region. But, depending on the path — and some models show it running up the Chesapeake — the local impact could be more serious, such as seen with Hurricane Agnes in 1972 or Hurricane Floyd in 1999. Both of those storms caused widespread flooding across the region and damage. Of course, the storm could just track to the west, over Appalachia, severely weaken and impact the area as little more than showers next weekend — the best case scenario for the region — so keeping an eye on the track of the storm is important for local residents. Another complication: thanks to the heavy rains this past weekend from the remnants of Tropical Storm Gordon, along with forecasts for additional rain throughout the week, the ground will be well saturated and unable to absorb additional rainfall, experts say, making flooding a much more serious threat. The best bet for local residents: keep following the track of the storm and watch for watches and warnings issued by the National Weather Service. The Times will continue to monitor the storm and offer local updates and advice from local officials.